VpCI-323 is a vapor phase corrosion inhibiting oil-based concentrate for use with working engine systems. VpCI-323 provides excellent protection in indoor and outdoor atmosphere conditions. VpCI-323 protects in two unique ways. First, oil-soluble corrosion inhibitors offer a tenacious film which clings to metal surfaces, giving excellent contact corrosion protection. In addition to this film barrier, Cortec VpCIs release vapor phase corrosion inhibitors into the air above the oil. These VpCIs attach electrochemically to the metal surface for additional corrosion protection. Add VpCI-323 to oil at a ratio of 1 part VpCI-323 to 10 parts oil for 24 months protection. Fog cavity interior with VpCI-323 concentrate using 1 liter per 35 ft³ (1.1 m³) of enclosed space. Fill reservoirs to 10% below full capacity. Add VpCI-323 to reservoir at determined dosage (>10% reservoir capacity). Run vehicle or equipment a minimum of 15 minutes to circulate oil thoroughly throughout system. The product should be sealed before storage. The shelf life of VpCI-323 is up to 24 months. 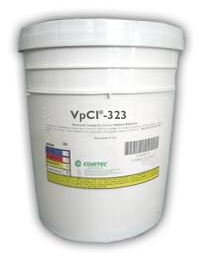 VpCI-323 concentrate is available in 5 gallon plastic containers (Cortec Product # 12100989) or 55 gallon metal drums (Cortec Product # 12100991). 5 gallon drum weighs 50 pounds and ships under our standard shipping rates. The 55 gallon drum must be shipped by truck. We will provide you with a freight quote before we ship this product. VpCI-323 should be stored sealed and has a shelf life of up to 24 months in sealed drums.